The first view of this very interesting city is remarkably grand and taken altogether there are few localities which impress themselves more forcibly upon the imagination. It is supposed to have been the ancient Bibracte capital of the Aedui, but its name was changed in the time of Augustus into Augustodunum, modernised into Autun. 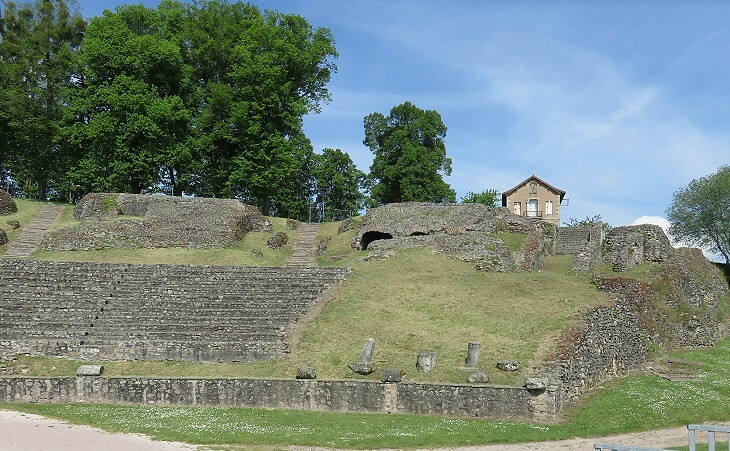 Autun was the heir of Bibracte in the sense that it was founded by Augustus some 15 miles south of the latter with the purpose of providing the Aedui with a capital consistent with their status of allies of Rome. The new town was built in a strong position between a low ridge ending with a small ravine (south-east side) and the River Arroux (north-west side), a tributary of the River Loire. 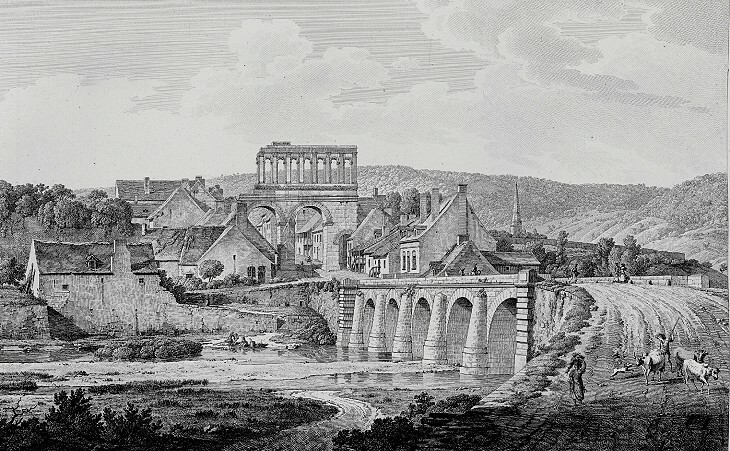 Autun and the River Arroux in a plate from "Alexandre de Laborde - The Monuments of France Chronologically Classified - 1816-1836"
Those that intend to travel from Paris to Italy must set out for Lyons, to which city there are three different routes. 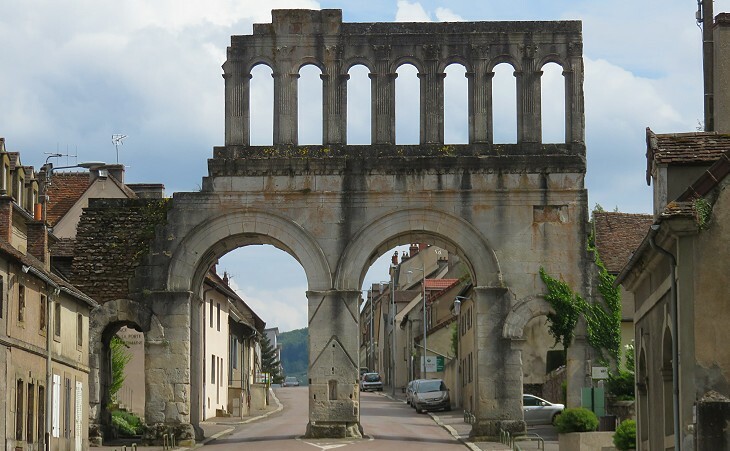 Autun was not on any of the three routes mentioned by Nugent a fact which explains why it was not visited by British travellers until Laborde's book made its ancient monuments popular. The Roman town had an overall square layout with a grid of cardi (north-south streets) and decumani (east-west streets) and it was protected by walls. Marcus Vipsanius Agrippa, son-in-law of Augustus, promoted the construction of a road between Lugdunum (Lyon) and the English Channel to strengthen the Roman military control over the region and to promote trade. 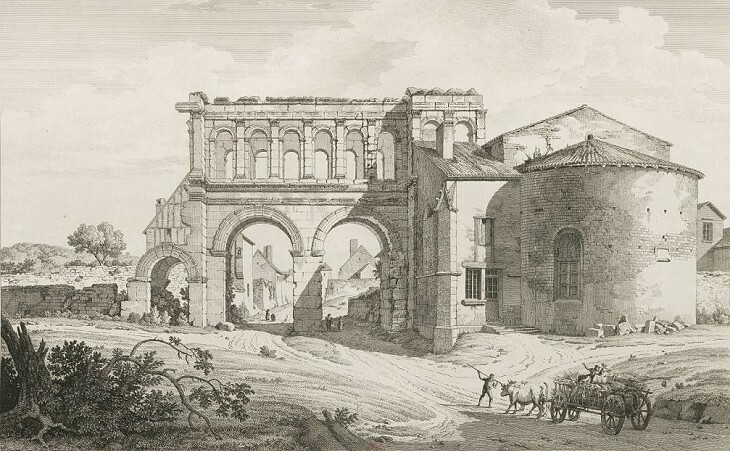 The road crossed Autun from south (Porte de Rome, a gate which was demolished in the XVIth century) to north (Porte d'Arroux). The town was part of Gallia Lugdunensis, one of the provinces which were created after the conquests made by Julius Caesar. The walls were built at the same time as the town and their purpose was not merely a defensive one. 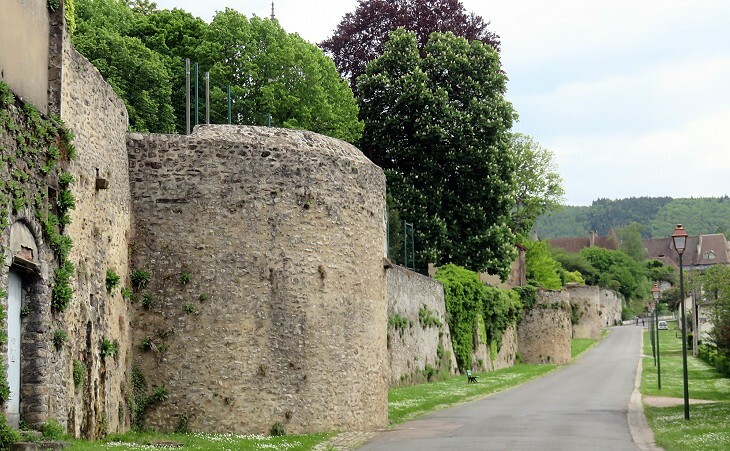 First of all they showed that Augustus trusted the Aedui to the point of allowing them to live in a fortified town, secondly the walls were instrumental in the terracing of the ground so that the new town lay on a smooth terrain gently sloping down towards the River Arroux. Overall Autun was meant to physically show the reward the Aedui received because of their loyalty to Rome. Roma Celtica, Soror et Aemula Romae (Celtic Rome, Sister and Disciple of Rome) is the motto written on the façade of the Town Hall of Autun. Today the gates are dated almost at the same time as the walls, because they were probably built during the rule of Emperor Tiberius. The left arch for carriages is slightly more worn out than the right one because the Romans kept the left side of the road. Since I saw it, I felt I was in Italy. After the defeat of three legions at the forest of Teutoburg in 9 AD the Romans gave up plans for expanding their Empire beyond the River Rhine, but they secured the border with a series of military forts where they stationed many legions; therefore Autun was not at risk of being attacked and the design of the gates shows their celebratory, rather than military, intent. 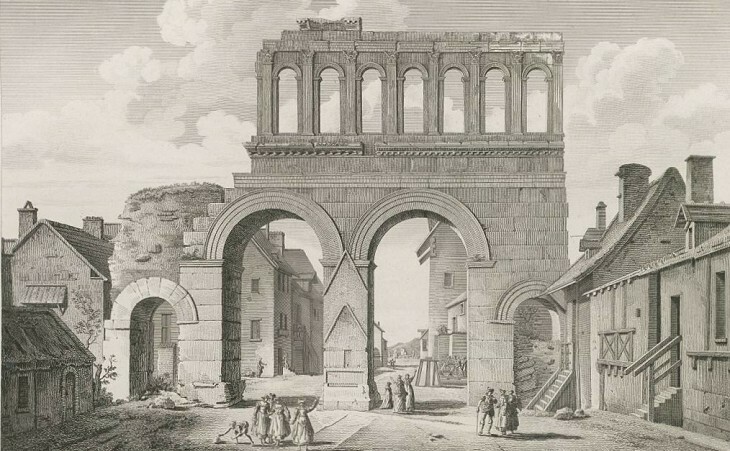 The gates were tax collection points and it is likely that another sort of barrier stood behind them thus creating a courtyard where goods were inspected and duties were paid (see Porta San Paolo in Rome). The existence of four passages was of help in ensuring these activities were smoothly carried out. French architect Eugène Viollet-le-Duc restored and partly rebuilt the gates in 1844-1850. 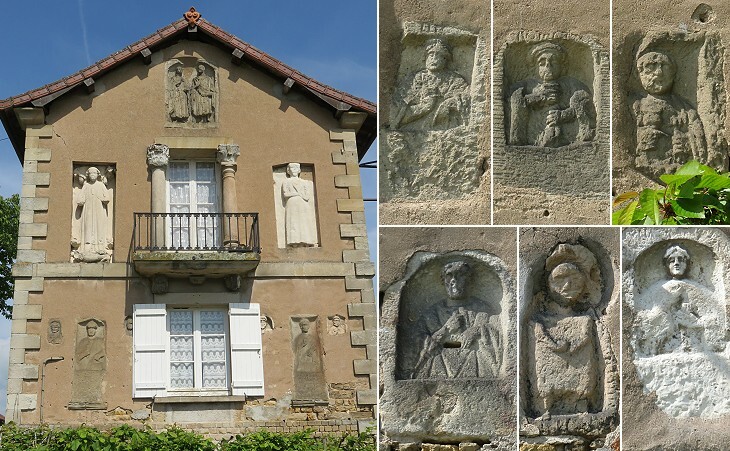 Luckily in 1840 the Temple of Janus was included in the list of historical monuments of France and it still stands outside the town near the River Arroux. The building is most likely a temple having the shape of a tower rather than the gigantic cella of a traditional temple. Its dedication to Janus is not supported by evidence, while its location outside the town suggests it was part of a sanctuary. When Murray wrote his book some ancient ruins were thought to belong to an amphitheatre, rather than to a theatre which was unearthed by later excavations. It was probably built during the rule of Emperor Vespasian. Its size makes it the largest Roman theatre of France, but only parts of the seating section withstood the ravages of time (you may wish to see the well preserved scenae frons of the theatre of Orange. From a distance the house seems to be decorated with fragments from the theatre; maybe a couple of columns do come from the theatre, but the reliefs are funerary stelae which were found at Champ des Urnes (Field of the Gravestone) an area between the southern walls of the town and a hill which is named after Pierre de Couhard, a large pyramidal mausoleum. 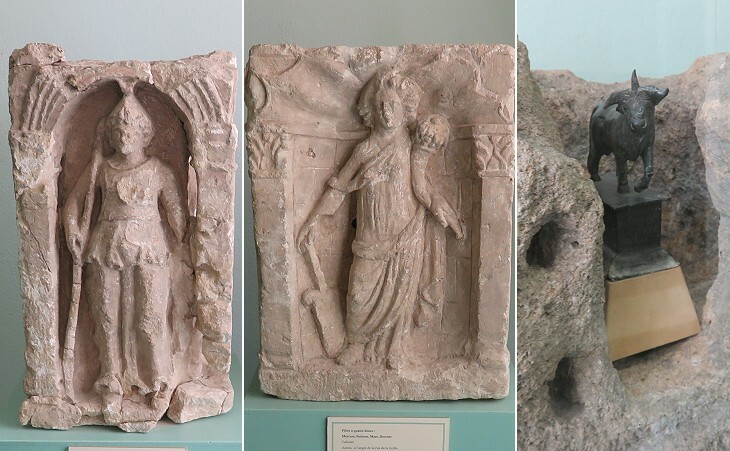 The reliefs are poorly executed, but many of them clearly show the dead wearing a large cloak and holding something, maybe a sceptre or a working tool. Nor is the practice of divination disregarded even among uncivilized tribes, if indeed there are Druids in Gaul - and there are, for I knew one of them myself, Divitiacus, the Aeduan. He claimed to have that knowledge of nature which the Greeks call 'physiologia', and he used to make predictions, sometimes by means of augury and sometimes by means of conjecture. Divitiacus was a chief of the Aedui who sought the help of the Roman Senate after his people had been defeated by other Gallic tribes. 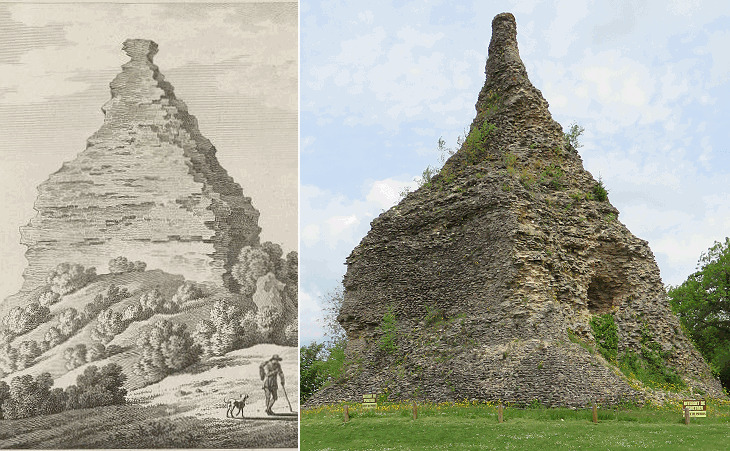 The pyramid was traditionally thought to be his mausoleum, or a cenotaph (it does not contain a proper funerary chamber) dedicated to him by the Romans, maybe by Vespasian. It was most likely faced with marble or limestone, similar to Piramide di Caio Cestio, but in its current aspect it resembles the Pyramidal Tomb near Villa dei Quintili. 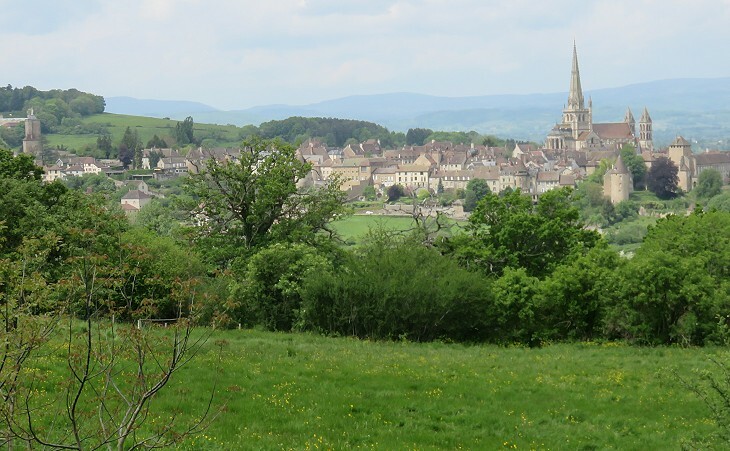 The prosperity of Autun came to a halt in 270 when the town was sacked by Victorinus, leader of the short-lived Gallic Empire. The reconstruction of the town was promoted by Emperor Constantine after he visited it in 311. In 356 it was sieged by the Alamanni and only the intervention of Julian saved it from total destruction. 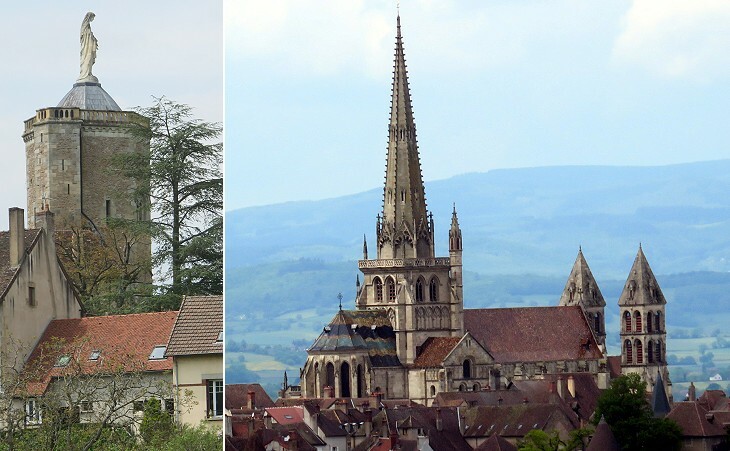 Eventually Autun was conquered by the Burgundi, after whom the region and its wines were named. In 725 it was sacked by the Moors of Spain in their easternmost raid into France. 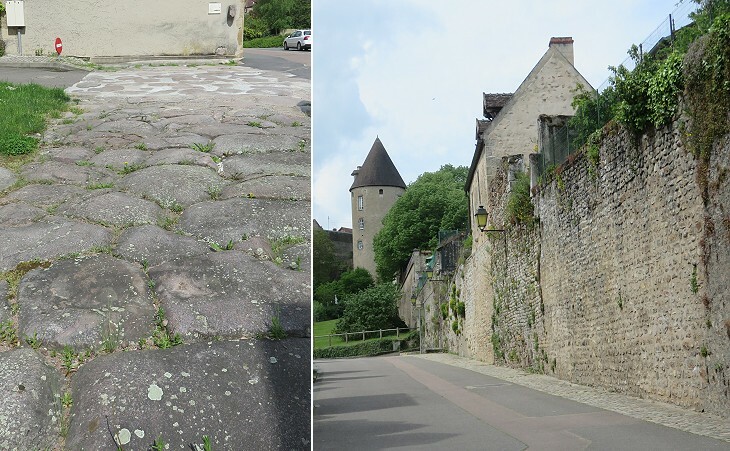 After this event the very few remaining inhabitants of Autun lived inside a tiny enclosure on the highest point of the town. Only in the XIIth century the population grew enough to occupy all the southern section of the Roman town and to begin the construction of a large cathedral. 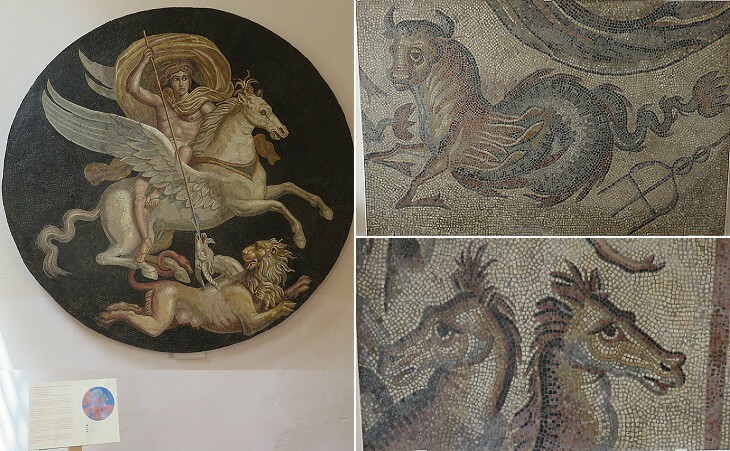 Today not all visitors share Murray's enthusiasm for this mosaic, because it was too much restored by its owner and it ended up by becoming a XIXth century creation (you may wish to see a less restored similar mosaic at Girona). 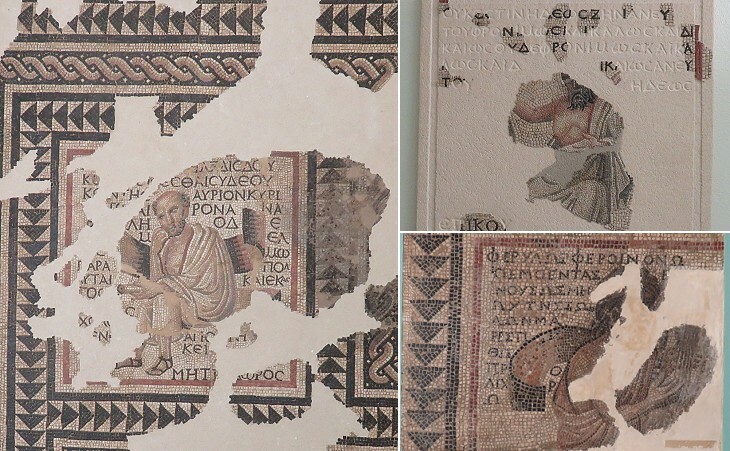 Other fragments of mosaics show that the rich houses of the town had finely decorated floors. The image used as background for this page shows a detail of another mosaic. 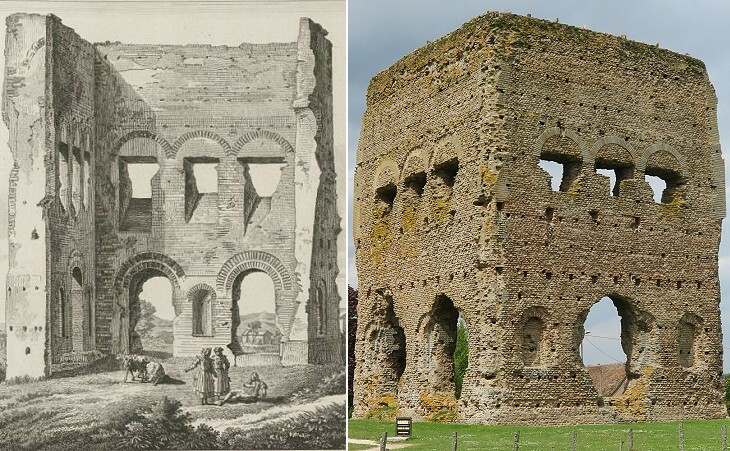 Tacitus mentioned the school of Autun in connection with events occurred during the rule of Tiberius. It was still flourishing in the late IIIrd century because we know that its premises were repaired in 298. This floor mosaic perhaps embellished the house of one of its teachers. It is a sort of compendium of Epicureanism; the portrait of each Greek philosopher is accompanied by a short quotation (real ones, not as those at Terme dei Sette Sapienti in Ostia). The maxim attributed to Metodorus is a manifesto of Epicureanism: We are born only once; it is impossible for any one of us to be born twice; after we die, we cease to exist; that non-existence stretches out into perpetuity. The mosaic was found broken into small pieces in 1965 and 1990 and it is very likely this was done on purpose. You may wish to see a similar mosaic in Lebanon. 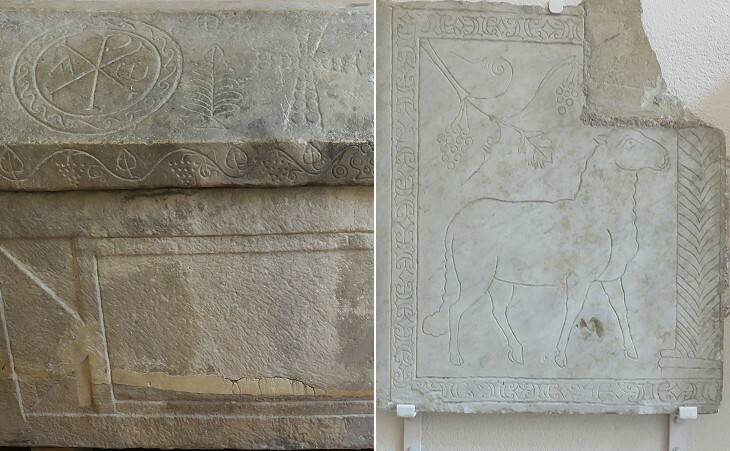 Autun retained local traditions more than other towns in Gaul which were Roman colonies. The altars to Minerva and Fortuna show the influence of Rome, but the unusual altar with a bronze statue depicting a bull with three horns derives from the particular significance which the Gauls gave to number three (see a three-faced head and a votive relief of the Three Mothers at Lyon). A Latin inscription indicates that it was dedicated to Emperor Augustus by Boiorix; -rix is a suffix meaning king (e.g. Vercingetorix means King of the Arverni) and the Boii were a Gallic tribe who were forced to settle in a town near Autun by Julius Caesar (they are best known for having joined the Senones in an invasion of Italy in 390 BC). 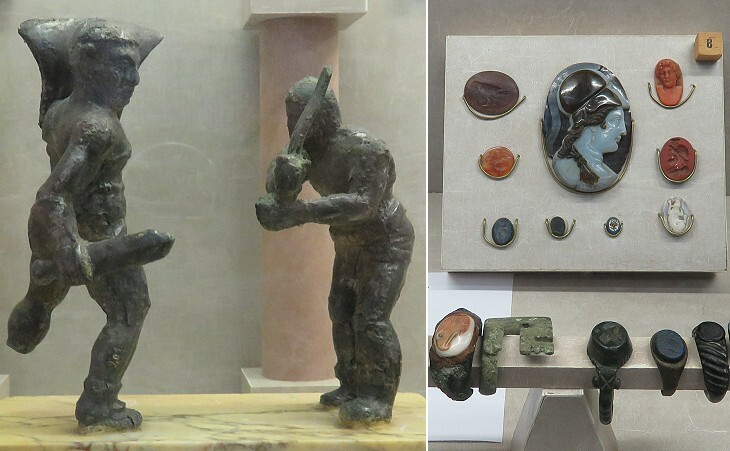 Gladiators were portrayed in very many reliefs, mosaics and even lamps, but these small bronze statues are pretty rare, also because they do not reflect traditional canons of beauty, but seem a work by Auguste Rodin.